Making mini scale extracts from C. elegans for visualizing proteins and RNA has been difficult and inefficient due to the nematode’s sturdy outer shell, the cuticle. Boiling and sonication have been the methods of choice with some success, but both have their limitations. Boiling nematodes irreversibly denatures proteins, while sonication produces low, inconsistent yields. Even an extended period of sonication leaves many intact and halved nematodes in the extract, which renders biochemical experiments rather challenging and erratic. Boiling nematodes in SDS sample buffer provides an efficient way to visualize proteins on SDS-page protein gels, but certain proteins do not enter the gel due to the heat treatment. Here, we show a quick and efficient method of worm grinding with clean sea sand. The method is fast and high-quality extracts can be obtained in an Eppendorf tube for protein gel and RNA extractions. If desired, the sand can be separated from the extract and the clean extract can be obtained in a minimum amount of time. Method: The method is optimized for 40 to 100 μL of clean worms. The worms should be totally cleaned from the bacteria with two to three washes with double distilled water (0.01% Triton X-100) in a clean Eppendorf tube prior to lysis. Extra water should be gently removed to make sure that addition of the 2X sample buffer yields the appropriate dilution of buffer for sand grinding. A small scoop of 30 to 40 μL volume of washed clean sand (Fisher Chemicals catalog #14808-60-7) should be added to the worm pellet. 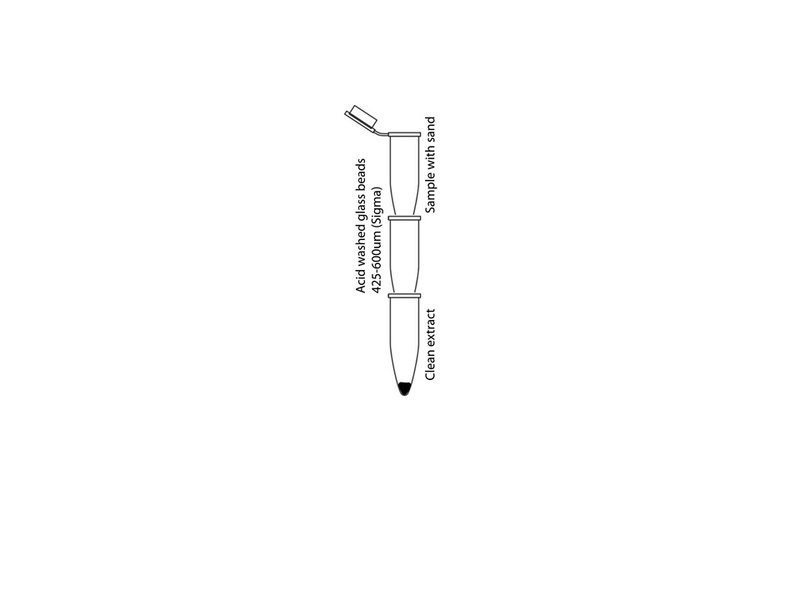 2X LDS* (Lithium Dodecyl Sulphate) sample buffer with protease inhibitors is added (equal to worm volume) to the tube and transferred to an ice-cold metal block; other sample buffers are also acceptable. Immediately after transfer, lysing of the worms is performed. 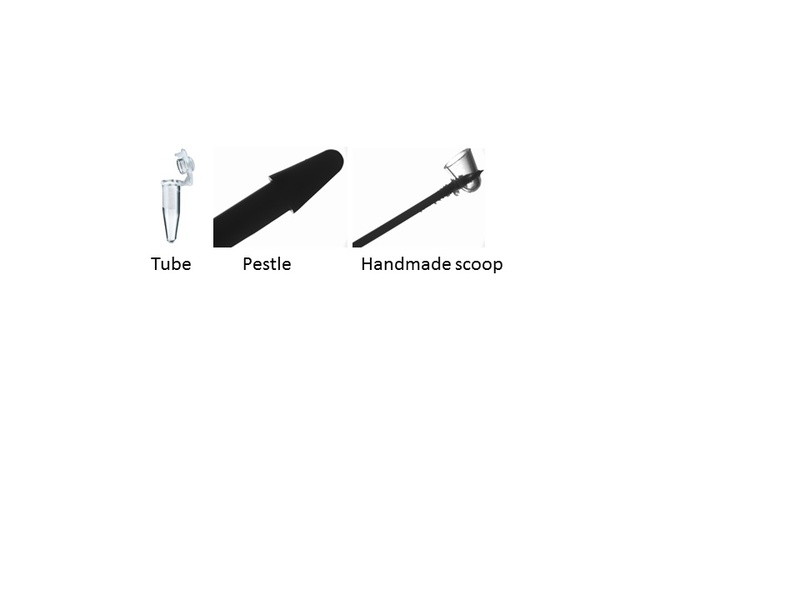 An ice-chilled pestle (glass or plastic) is inserted into the bottom of the microfuge tube and rotated fifty to seventy five circular strokes until very little resistance is felt. At this point, the extract can be flash frozen and handled at a later time-point. For a smaller volume of extract, it is rather important to separate the extract from the sand to maximize the yield. This can be easily performed by filtering the sand extract through a small microfuge tube column with a small needle-size hole in its bottom. The hole should be covered with 100uL of clean glass beads (425-600 μm, Sigma G8772) and be placed on top of another empty clean microfuge tube. The stack of tubes can be assembled in a 15 ml blue cap tube. Once the sand extract is ready, the tube should be put on top the tube that has glass beads at its bottom. A clean injection needle can now be pushed through the bottom of the tube with sand extract until a hole is made. Centrifugation at 2K RPM for 1 to 2 minutes provides an extract that is virtually free from sand particles. For RNA preparation, washed worms are harvested in Trizol solution (Life Technologies), at which stage they can be snap-frozen and stored at -80 0C for RNA extraction at a later time-point. Worms are ground in Trizol with sea sand and pestle as described above. After filtering of the sand, RNA is extracted using the PureLink RNA Mini Kit (Life Technologies) and eluted in RNAse-free ddH20. Extra caution should be taken to make sure that sand, tubes, solutions and tools are totally RNAse free. The sand should be baked at 240 °C for at least 4 hours and plastic RNAse-free pestles should be purchased. Acknowledgements: This work was supported by funding to BW from NIH (NS060872 and ES020395). Figure 1: A. A SDS page gel showing Actin and Lgg1:mCherry fusion protein from two different transgenic nematodes (lanes 1 and 2). B. Total RNA extracted from n=100 day 5 adult worms with sand/pestle method. Visualized on 1% agarose gel. Articles submitted to the Worm Breeder’s Gazette should not be cited in bibliographies. Material contained here should be treated as personal communication and be cited as such and only with the consent of the author.